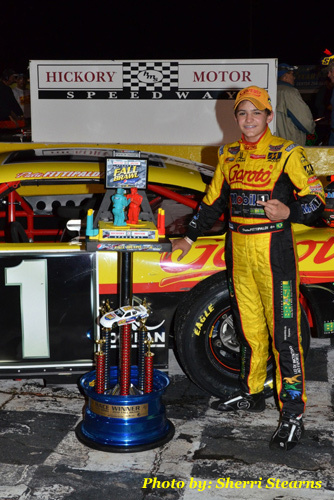 Pietro Fittipaldi Gets Big Win In "Annual Pepsi Fall Brawl"
(Hickory, N.C. – Sept. 29th, 2012) At first glance it appeared the weather would be the winner Saturday night at Hickory Motor Speedway, but the skies would clear and the action would become intense. Only .040 hundredths of a second would separate the top 6 Bojangles Late Models qualifiers as Mackena Bell captured her first pole of the season by only .010 hundredths over Matt Piercy. Bell would take the early lead followed by Piercy, the #12 of 2012 Track Champion Austin McDaniel, the #8 of David Garbo and the #1 of Pietro Fittipaldi. The cars would settle in to pace their selves for the 200-lap event. Lap 48 would bring out the first caution for a spin in Turn 4. McDaniel would bring them to the green after taking the lead earlier from Bell. Garbo, Fittipaldi, Bell and the #51 of Josh Wimbish would follow. Garbo would assume the lead just before the halfway point. The battle would resume among all of the leaders for the 2 nd half of the race with the lead exchanging several times with several drivers. As Garbo led, Fittipaldi would move by McDaniel for 2 nd and Wimbish would work past Bell for 4 th . Caution would come out on lap 197 for the #22 of Chad Reed, who was the victim of a flat tire, setting up a green, white, checkered. A wild battle would ensue, but at the line it would be Fittipaldi, Garbo, Wimbish,the #2 of Trey Gibson and McDaniel would round out the top 5. Shane Lee would be the pole sitter for the 50-lap Paramount KIA Limited Late Model race with the #6 of Brandon Setzer starting on the outside. Lee would take the early lead followed by Setzer, the #15 of Brandon Atkinson, the #51 of Jeremy Pelfrey and the #21 of Roger Pitts battling for 5 th with the #75 of Landon Huffman. The #71 of Jason Smith would lose a motor and crash hard into the wall for the second caution. Pelfrey and Atkinson would battle for multiple laps for the 3 rd before Pelfrey took the position. At the checkered it would be Lee followed by Pelfrey, Setzer, Pitts and Atkinson rounding out the top 5. Dillon Crouch in the #64 was fast timer and led the Red Baron Renegades to the green for their 30-lap feature and he would take the early lead, but it would be the #4 of Greg Austin taking his first win of 2012 after a fierce battle with the #16 of Carroll McKinney, the #6 of Darren Dickinson was third, the #22 of Daniel Moore fourth and Crouch rounding out the top 5. Next race - October 20 – Rev-Oil Pro Cup Series – 250 Laps - Racing Action @ 7pm – Adults $15 – Youth (6-15) $5 – Kids 5 & under Free. Saturday – October 27 – Fall Classic 100 – Paramount KIA Limited Late Models – 100 laps, Super Trucks – 50 laps and Red Baron Renegades – 30 laps. Tickets: Adults $10 – Teens/Seniors $8 – Kids 12 and Under Free. Saturday – December 8 th – 2012 Champions Banquet at Pin Station/Newton Expo in Newton, NC. More information will be posted on our website www.hickorymotorspeedway.com in the upcoming weeks.